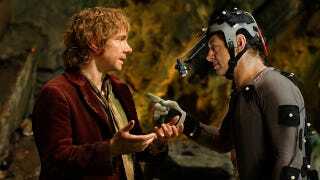 Now that we're getting closer to the release of the first Hobbit film, we're finally starting to see the visual story of how Peter Jackson is bringing the novel to the screen. 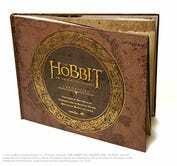 The Hobbit: An Unexpected Journey Official Movie Guide and the Visual Companion include production images, from Dwarven concept art to extras dressed as Hobbits and goblins. Redditor kami77 uploaded a massive gallery of images from the books, but if you want to see them at their full resolution and with explanatory text, you'll need to get a hold of the books themselves. The embedded gallery below, and it shows us some things we've seen before, including the Dwarves and production stills from Bag End. But there's also a fair amount of concept art, lots of Goblins (including the Goblin King), and tons of cool behind-the-scenes moments with the stars, extras, hair and makeup crew, and, of course, Jackson himself. It also hits home just how must green screen was involved in the making of this film. It won't be out until mid-December, but now I'm really looking forward to Weta's book on the art and design of the film.